This version of a Snowball quilt block, a plain square with triangles at its corners, is one of the most versatile quilt blocks you'll encounter. Snowball quilt blocks can be used as the only block in a quilt, but the design is always one to consider when you're looking for an alternate block – something to sit beside other designs. Think of the design as a connector – when the triangles align with the patches of a neighboring quilt block, the combination makes one block seem to flow into another and adds diagonal movement within the quilt. 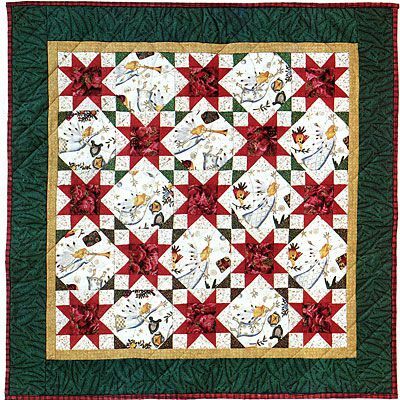 The star quilt above, called A Joyous Celebration, alternates star quilt blocks with Snowballs, and the green corners of the Snowballs link with the red star tips along the diagonal. The neutral print used in the Snowball blocks blends into the printed fabric used for the star backgrounds, making the Snowballs appear to be set on point, even though they are in a straight setting. You can alter Snowball quilts block to make the patchwork mesh with nearly any layout. If you're new to quilting, it would be helpful for you to get familiar with patchwork bone structure before you decide how to construct your Snowball blocks, because there's no single corner configuration that works with every block. Continue reading below for Snowball patterns and examples. The corner triangles of this Churn Dash (variation) are smaller than normal to flow with the narrower frames that surround the block's center square. Make the corners of the Snowball smaller too, so that they link with the Churn Dash to create a secondary design where corners meet. The patchwork divisions at the Churn Dash block's corners take up one-sixth of the length of each block side. We'll make our Snowball tips the same length so that they intersect with the Churn Dash patchwork. one-sixth = 1" for a six-inch finished block. cut (4) 1-1/2" squares for the 6-inch block. Use the quick Snowball corners method to sew a small square to each corner the large square. Trim and press -- the Snowball quilt block is complete. The Friendship Star is a nine-patch quilt block, with three equal divisions along each side. The tips of your Snowballs will flow in sync with the stars if you make them with triangles that take up the same space -- one-third of the block's sides. For a 12-inch block, one-third = 4". Cut a 12-1/2" square of fabric. Cut four 4-1/2" squares and use the quick pieced Snowball method to sew them to the corners of the large square. Clip and press. To use a Snowball as an alternate with a 9-inch Friendship star quilt block, one-third = 3". Make the Snowball by sewing 3-1/2" squares to the corners of a 9-1/2" square. For a 6-inch block, one-third = 2". Sew 2-1/2" squares to the corners of a 6-1/2" square. Do see a pattern? We're adding 1/2" to the finished size of the block segment that we want the tips to match. Look closely at your patchwork to determine where you want the Snowball tips to meet the segments on an adjacent block. Calculate the finished length, add 1/2", cut squares that size and you're good to go. Be sure to add 1/2" to the large Snowball square's finished size, too, so that it matches the unfinished size of the quilt block it will rest against. There might be times you want Snowball tips to be larger than the patchwork in the adjacent quilt block. Analyze the pattern to determine how the layout will look if you increase or decrease the size of your Snowball tips. The Double Nine-Patch layout below is a good example of how a quilt might look when you alter the tips of Snowball blocks. The Double Nine-Patch quilt block has three natural divisions along its corners, at the end of each small patch in the corner units. I've drawn Snowball blocks with three different tip sizes that correspond with the small squares. Which one do you like best? In the top left illustration, very small triangles at the corners of Snowball quilt blocks give the layout somewhat of a circular appearance. Top right, the triangles are a bit larger, ending at the midpoint of each small nine-patch. Do you think it makes the Snowball blocks pop out just a bit more? The Snowballs in the bottom illustration does more than add flow to the layout -- they are a prominent part of the quilt. Keep in mind that color and color value selection can make even tiny triangles more noticeable. Snowball quilt blocks can be used as the quilt's sole design element. This Floral Snowball quilt is one example of Snowball quilt blocks that look great without any help from another block. If you enjoy applique, sew a shape within the Snowball blocks -- take a look at our Heart in a Snowball Quilt Block Pattern.